Tim Hartman has had a long and exciting martial arts career. His journey started as a teenager when he started training at a Modern Arnis school and fell in love with the art from the very first class. It wasn’t long before he caught the eye of Professor Presas. After Tim earned his brown belt Grand Master Presas took him as his personal student and protégé. Not long after this Grand Master Presas had Hartman assist him at seminars and camps throughout the United States and Germany. In time Professor Presas took to calling Tim “anak,” the word for “son” in the Tagalog dialect of the Philippines. Impressed with Hartman’s technical skills, Professor Presas started trusting Tim with administrative duties. He directed Tim to form the Can-Am (Canadian – American) chapter of the International Modern Arnis Federation in order to help develop schools along the Canadian American border. As Can-Am’s director Hartman was able to positively impact the development of instructors throughout the region. 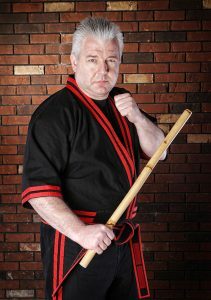 After establishing a successful instructors development program Hartman spearheaded a movement to bring Modern Arnis to the competitive arena by taking members of his youth program to the local tournaments. On their first outing his team dominated the sparring divisions. Soon they hosted and competed in full contact tournaments and weapons matches. Hartman himself became an international tournament champion, a tournament promoter, and a popular referee throughout the US, Canada, Scandinavia, and England. Following his venture into the sport world, Hartman put his focus back on the art of Modern Arnis and continued his development as an instructor. Working with Professor Presas around North America and Europe also allowed Tim to study other systems with some of the best instructors in the martial arts world. Among these are Grand Master Wally Jay, Grand Master Ron Van Browning, and Dr. Maung Gyi. Eventually Hartman met one of Professor Presas’ classmates from the Philippines, Balintawak Escrima Grand Master Ted Buot. With Professor Presas’ blessings Grand Master Buot took Tim on as a personal student. Tim feel’s that he had two defining moments in his Filipino Martial Arts career. The first was during his 6th degree black belt test at the 2000 Michigan Modern Arnis Camp. Following the test Professor Presas announced that Hartman’s promotion was the highest tested belt in over 17 year’s. Professor Presas added that this made Tim his top ranked student in the United States. He also awarded Hartman the title of Datu (chieftain or leader). There have only been six people in the world awarded this title by Remy Presas. The second was on April 23, 2007 Datu Hartman was promoted to 9th degree in Kombatan and awarded the Grand Master title by Great Grand Master Ernesto Presas while visiting the Philippines. After Professor Presas’ retirement due to illness Hartman formed the WMAA (World Modern Arnis Alliance) in order to preserve and continue the progression of the art of Modern Arnis. He is currently the WMAA’s President and Technical Director.